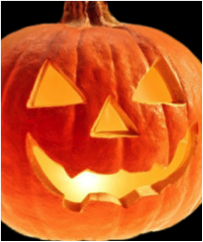 Earlier this week, my colleague Anne Mathers-Lawrence posted a blog with the provocative title Who Invented Hallowe’en? It is a fantastic overview of the medieval origins of All Saints’ Day and All Souls’ Day, and a reminder that many of the questions that we ask about rituals and traditions can only ever be answered by a ‘definite maybe’. Jeremy Burchardt’s comment at the foot of the page that “It would be interesting to trace the post-Reformation history of Hallowmass but we need an Early Modernist for that!” was hard to ignore. The pre-reformation church was not simply the visible buildings that dotted the landscape of late medieval Europe, impressive though some of these are. Christians, alive and dead, were part of a single community, linked by prayer: the saints in heaven intercede for those on earth, the living faithful prayed for the dead, and the souls in purgatory find their suffering diminished through the prayers of the living. Such prayers might be offered throughout the year, but All Souls’ Day was a special occasion on which to remember the dead, and hope by Masses, prayer, and almsgiving to facilitate their release from Purgatory. Food might be left for the dead on All Souls’ night, and ‘soul cakes’ baked. The dead were, in many respects, seen a part of the community of the living, who they reminded of their obligations in wills, on tombs, and sometimes by returning from purgatory in the form of revenants or ghosts. 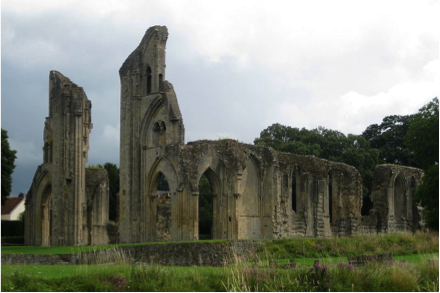 A monk of Byland Abbey in Yorkshire recorded several local ‘ghost stories’ in which the dead returned to the living to ask for prayer or forgiveness. “Robert the younger”, he wrote “died and was buried in the churchyard, but used to go forth from the grave at night and disturb and frighten the villagers”. It was only when a priest was found to absolve him of his sins that peace was restored. Ghost narratives like this helped to reinforce the presence of the dead in the community living, and the reality of sufferings in purgatory. Put simplistically, the Protestant reformations of the sixteenth century abolished purgatory, and by doing so, broke apart the bonds that tied together the living and the dead. 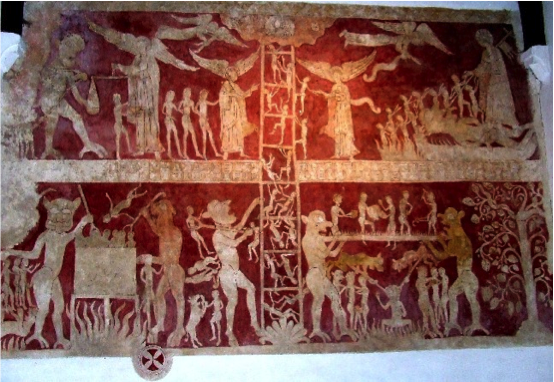 Critics of the medieval church argued that purgatory was the invention of the papacy, and that neither its existence, nor the devotional practices associated with it, had any basis in Scripture. 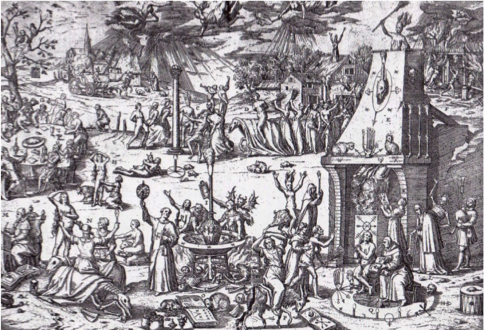 Purgatory was a ‘fond thing vainly invented’; it was a money making venture for the church, and it encouraged the faithful to see their own actions, rather than faith, as the foundation of salvation. Chantries were abolished, monasteries were closed, liturgical and other ritual practices associated with intercession for the dead were suppressed. In theory, the abolition of purgatory should also have abolished ghosts; there was nowhere from which the dead might return to earth, and the pious observances requested or counselled by ‘traditional’ medieval ghosts were no longer necessary. In the words of Robert Wisdom, ‘souls departed do not come again and play boo-peep with us’. The impact of all this varied. In some areas, traditional practices ceased altogether, but in others activities that were intended to commemorate, comfort, and console the suffering souls in purgatory continued, but outside the church. Fires were lit, bells were rung in violation of royal injunctions, and prayers were said, but in fields and houses rather than within the walls of the church. Despite the assertion that ghosts did not exist, they continued to be seen and heard in post-Reformation Europe, prompting a robust polemical and pastoral response from Protestant reformers who dismissed such apparitions as feigned, imagined, and superstitious, but still needed to deal with members of their flock who thought they had seen a ghost. So are the consequences of these beliefs and debates still visible today? It is not always advisable to plunder the past to explain the present, particularly where complex ritual and cultural practices are concerned. But the current season does invite some speculation about potential influences of the past in the activities that we associate with modern Hallowe’en. One example that springs to mind is the custom of soul caking. Soul cakes (which resembled oatcakes) were special breads baked or offered for the dead at Hallowmass. The medieval preacher, John Mirk mentions this tradition of “souling” in a sermon from around 1380 – “… wherefore in olden time good men and women would this day buy bread and deal [give] it for the souls that they loved, hoping with each loaf to get a soul out of purgatory”. In some parts of England children continued to go from door to door, exchanging soul cakes for prayers for the dead, or singing and begging for soul cakes in remembrance of the dead well into the 19th century. Food might also be left on windowsills for the ancestral spirits or put in graveyards for the dead in purgatory, or even to appease witches who were feared to be more active at this time of year. There is little evidence that these practices were connected with the survival of explicit Catholic beliefs about the dead after the Reformation, but they give us a nice example of the way that a practice derived from pre-Christian cultures and imbued with a Christian message could be carried forward in a different context, perhaps even influencing the more modern custom of trick-or-treating. Other parallels with ‘trick or treat’ might be seen in the traditional custom of mumming or guising. 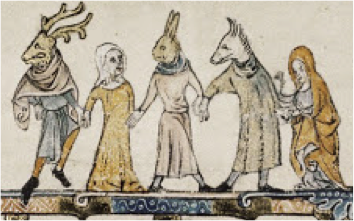 At this time of year, people were out and about at night dressed up in costume, sometimes singing or reciting rhymes outside houses in expectation of some reward, sometimes warding off the spirits of the dead. Costumes were not the same as those on sale in 21st century supermarkets! Most participants wore rags, sheep skins, or masks over their faces. In some parts of the country, youths played pranks on their neighbours, banging on doors and running away, or blowing malodorous smoke through doors in what became known as Mischief Night. Those who were out after dark carried lanterns with them, in the form of hollowed out turnips often carved with grotesque faces. By the nineteenth century there are accounts of competitions being held for the best carvings, suggesting that these lanterns were intended to amuse and terrify in equal measure. In Britain, turnips have now been largely superseded by pumpkin lanterns. There is a practical benefit in terms of easy carving (I still remember the pain involved in trying to hollow out a raw turnip with a teaspoon culled from the kitchens in my undergraduate hall of residence), but the influx of pumpkin lanterns is perhaps the clearest example of the intermingling of British and North American customs. So what about those ubiquitous witch costumes? We all think we know what a witch looks like, thanks to the ‘seasonal aisle’ in large supermarkets. But witches – especially those put on trial in the 16th and 17th centuries – don’t seem to have looked much like the modern costumes. 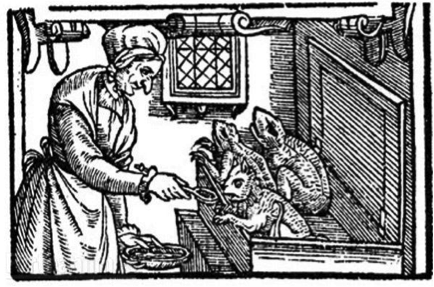 Contemporary images show witches dressed in ordinary clothes (or none at all) and accusations of witchcraft often arose from the most ordinary events. However there are references to witches riding on broomsticks or sometimes pitchforks. Alice Kyteler, Ireland’s earliest known accused witch, was reported to possess ointment “wherewith she greased her staffe, upon which she ambled and galloped through thick and thin.” In 1563, the German sceptic Johann Weyer 1563 listed the ingredients of these ointments as henbane, deadly nightshade, and mandrake – a range of accessible hallucinogenic plants that might explain the sensation of flight. The afterlife (perhaps a small pun intended) of such celebrations and commemorations beyond the Reformation is well worth thinking about, and might even help us to make some connections between the festivals that Anne described, and some of the activities that take place around Hallowe’en in modern Britain. This entry was posted in Anniversaries, Early Modern History. Bookmark the permalink. Well, barely had I expressed a wish to know more about post-Reformation attitudes to Hallowmass than this (to me) fascinating post appears. I hadn’t appreciated so clearly before how purgatory linked the living and the dead: it’s easy to understand that rituals with such a profound social meaning would have been relinquished only slowly and reluctantly by many. Nor had I realized that ghosts have nowhere to come from once purgatory is abolished. Witch beliefs certainly persisted in some rural areas well into the nineteenth century (see the article by Thomas Waters in the February 2014 issue of *Historical Research*) although I suspect that Halloween is, in most respects, a classic example of what Hobsbawm and Ranger termed an ‘invented tradition’. However, it would need a modernist…. oops!